Buccaneer, Explorer, Hydrographer and sometime Captain of the Ship ROEBUCK in the Royal Navy of King William the Third. 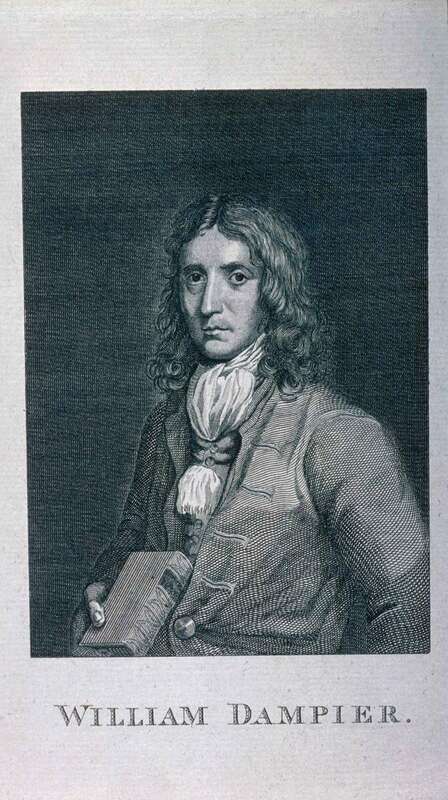 So reads the memorial to Englishman William Dampier in the village of East Coker, Somerset, England, the place of his birth in 1651. The memorial lists only a portion of Dampier’s eclectic career and speaks faintly of his contradictory character. Pioneer and pirate, criminal and captain, explorer, author, travel writer and buccaneer. Ironically Dampier, with his less than angelic past, visited Australian shores in 1688, a full century before the convicts of the first fleet. At its bleakest contrast, Dampier was a felon who created a historic legacy in the hallowed halls of literature, science and exploration. 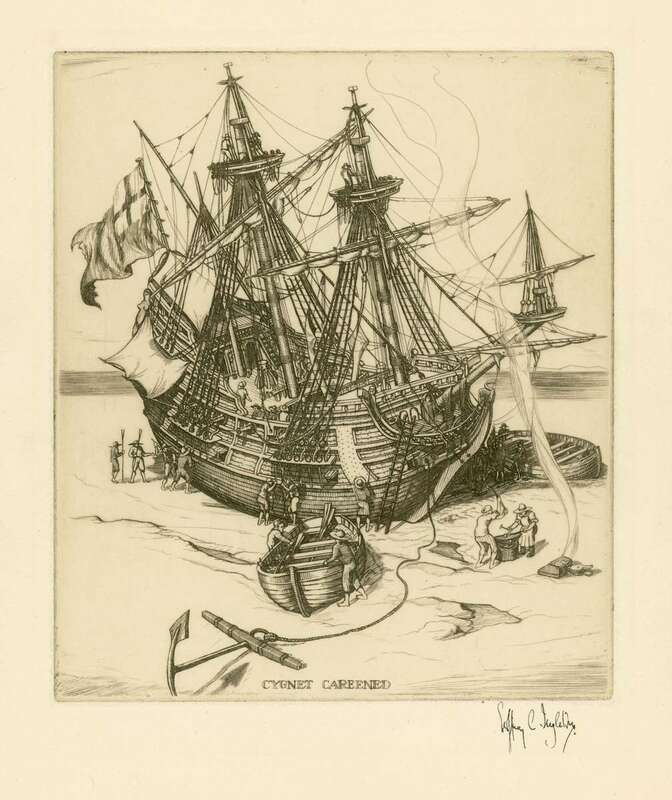 Sometime around 1685 Dampier switched to the crew of the CYGNET supposedly in order to satisfy his curiosity and explore the north of Mexico, rather than as a direct pursuit of wealth. During his travels Dampier kept a journal that would later be published as A New Voyage Round the World (1697) and this curiosity is reflected in its contents which are rich with observations on winds and tides, flora and fauna and the people and cultures he encountered. It is not yet determined whether it is an island or a main continent, but I am certain that it joins neither to Asia, Africa, nor America. After spending three months along the Australian coast, Dampier found his way back to England in 1691. The book based on his journal, A New Voyage Round the World, was published six years later and provided him with a popular legitimacy and authority on the South Seas. The British Admiralty were quick to seize on Dampier’s reputation and placed him command of a voyage of discovery to Australia. In January 1699 Dampier sailed from England in HMS ROEBUCK, anchoring in August later that year in the inlet he named Shark Bay. A lack of provisions caused him to sail to New Guinea in early 1700, after which ROEBUCK, in poor condition, became stranded off Ascension Island. Dampier and his crew limped back to England by the grace of a passing East Indiaman in 1701 and the expedition ended ungraciously with Dampier court martialled and declared unfit for further employment in the Royal Navy. Despite proving an unreliable commander, Dampier remained in demand for his expertise as a navigator. He returned to privateering, working as the pilot of several vessels and circumnavigating the world twice between 1708 and 1711. One of the most remarkable events of this voyage came in 1707 with the discovery of Alexander Selkirk on Juan Fernandez Island. Selkirk had spent four years on the island after being marooned there and his experience formed the basis of Daniel Defoe’s classic novel Robinson Crusoe. Dampier’s own literary work gained popularity during his lifetime, coinciding with the emerging Age of Enlightenment and an interest in the ever-expanding known world. 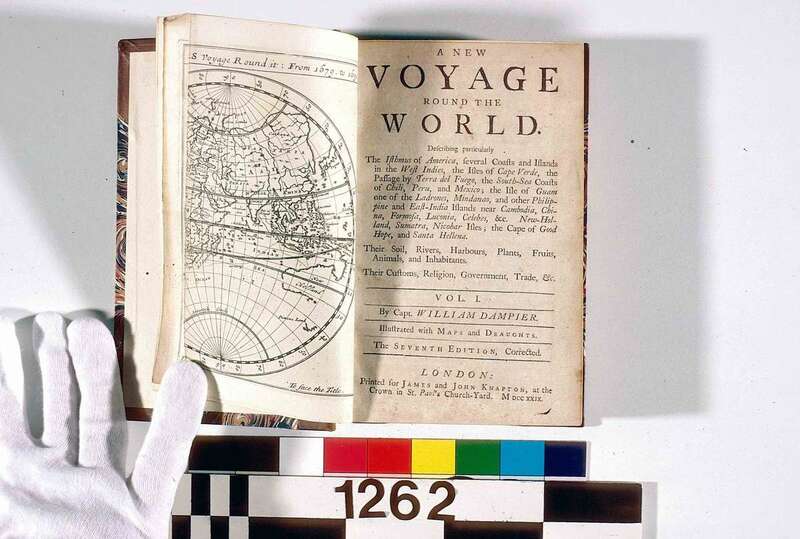 After its initial publication in 1697, A New Voyage Round the World ran to four editions within two years and subsequent works took in his later travels. Dampier’s curiosity and visceral descriptions provided a wealth of information not only for his reading public but for academics such as Charles Darwin who referred to Dampier’s works during his voyage of the BEAGLE. Meteorologists, navigators and natural historians continue to praise Dampier’s efforts to the present day. Dampier died in London in 1715 although exactly how, where or when remains unknown. The memorial bearing his name in East Coker stands in place of a known grave and purportedly faced opposition at its conception, with complaints directed at the commemoration of Dampier’s reputation as a piratical seaman. However it is this very contradiction that reflects the core of Dampier’s fascinating historical character. It was within these buccaneering and privateering activities that Dampier’s literary, scientific and navigational achievements flourished and were in fact made possible at all.